With all the passionate headlines and blog posts written on the health care reform debate/Obamacare, and advances in digital medicine – it is easy to overlook the fact that most healthcare is actually delivered person to person, knee to knee, from doctor to patient behind a closed exam room door. Medicine is practiced “in the cloud” of one-on-one conversations in offices and hospital rooms all over the world, every single day. These are special conversations full of fear and intimate details. Important decisions are made, life and death hang in the balance at times. In the best cases, diagnoses are made, treatments rendered successfully, empathetic communication takes place, hands are washed and we all live to “fight” another day. The “tip of the sword” in almost every case is a human being – not a cell phone app or other piece of technology. The point of care is a doctor, nurse or similar front line member of the clinical team … and lost in all the smoke and mirrors of modern healthcare journalism is an important fact. The people at the point of care are often overstressed and burned out. Physician Burnout is an epidemic hidden in plain sight amongst the providers on the front lines. Healthcare organizations are often unhealthy for the people who work within them. Everyone knows this and yet burnout and wellness are rarely discussed. And like an elephant standing in the corner – you will pay attention to it sooner or later. Over the last 25 years, repeated studies have show an average of 1 in 3 doctors suffer from symptomatic physician burnout on any given office day. 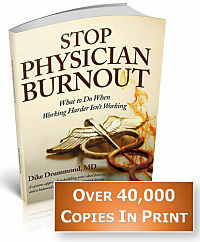 Recent surveys show burnout rates in US doctors topping 50% ! Some surveys – typically among surgeons – show physician burnout rates over 70%. Physicians are not the only ones suffering. There is no reason to think nursing burnout, or administrator burnout are any less prevalent. CEO turnover in Healthcare is the highest of all measured industries. How can you tell if you are at risk for physician burnout rather than just a little tired or stressed? There is actually a standardized assessment of Physician Burnout. It is called the Maslach Burnout Inventory (MBI). This scale has been in use since the 1970′s. It diagnoses physician burnout with three cardinal symptom clusters. You are drained after the office day, hospital rounds or being on call and are unable to recover with time off. Over time your energy level begins to follow a downward spiral. You find yourself being cynical and sarcastic about patients. Your attitude is negative, callous, detached, uncaring. You can feel put upon by your patients and complain about them to your colleagues. This aspect of burnout is commonly referred to as “compassion fatigue”. It is often easier for you to see this in others than notice it in yourself. Any level of exhaustion and sarcasm/cynicism/patient blaming that does not respond to time off is of concern. If you notice these symptoms getting worse over time — regardless of whether or not you feel you are doing good work — head’s up. You are on a physician burnout trajectory and will end up at a dead end if things don’t change. Most articles you will find about physician burnout on the web are what are known as List Articles. You know the ones with the title, “73 things you should be doing to lower your stress right now”. Doesn’t just reading that stress you even more?! Then they always add “for dummies” at the end as if questioning your intelligence is going to make their list even more compelling. Then what do I do? I read the darn list and start beating myself up for only doing two of the 73 things – and I AM NO DUMMY! How counter productive is this? Never fear – this is NOT a list article. 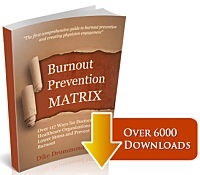 AND I will be publishing more articles here soon with specific, in depth physician burnout prevention tips and tools. For now let’s look at 3 major ways to prevent physician burnout. For each, let me give you a single, simple action you can take tomorrow to cut your stress and lower your burnout risk. Please read the options below and then PICK JUST ONE THING TO IMPLEMENT. Each of these action steps will be very simple to understand. My challenge to you is go beyond comprehension. Lowering your stress levels and beating physician burnout is not a matter of simply understanding the concept and its treatment. You must take different actions to get different results in your life. Pick one of the actions below and do it and see what difference it makes. => Take a big breath – up to the top of your head – and hold it for a 3 count => Then exhale all the way to your toes inviting any stress, tension or worry out with your out breath => Hold the full exhale for a 3 count => Then allow your breath to breathe normally. 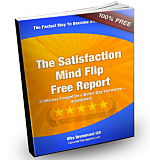 Go ahead and try it now …. Now, tomorrow at work take this “Squeegee Breath” each time you touch a doorknob to go in the room with a patient … and see what difference you notice in the quality of your day. This is just one lesson in our One Minute Mindfulness Online Training for physicians. What is one relationship you have been feeling a need to pay more attention to lately … someone would like to connect with and it feels like it has been too long? It might be your mom or dad, spouse or significant other, one of your children, a friend. GRAB YOUR CALENDAR right now, connect with them and schedule a “date” for sometime in the next two weeks. Minimum of 15 minutes – on the phone or in person. Then show up and see how it feels. If it felt really good … make sure you schedule your next date with this person before this date is done. Bring your calendar to the date and ask them to bring theirs. Put your next date on each of your calendars so you have “one in the hopper”. What is one thing you love about what you do? Think back over the last month or so … what is one interaction you remember that made you smile and reconnected you with what you love about your career again? This is most powerful when you take a moment to write this remembered experience down. Say it out loud, “Today I am going to look for a way to experience (what you love)”. Please pick one of these strategies now and do it. Then leave a comment below on your experiences with these physician burnout prevention “games”. Keep breathing and have some fun with your new action steps.